There’s an HIV shelter in Tijuana, Mexico, that brings me close to Jesus. Our Global Missions partner, Albergue Las Memorias, is an amazing place of men, women, and children who live in community caring for one another. When people first arrive, they are often quite ill, given a bed, and nursed back to health by other residents. Once they are restored to health they do the same for the next incoming folks. Church groups can see biblical stories come with every visit. Prodigal drug users are welcomed back “home,” given blankets, food, love, and encouragement. Physical bodies are resurrected with their first steps down the hallway and out of the infirmary. Modern “lepers” whom family members and society have abandoned are held and touched. And Jesus can be seen in about 100 faces hanging out, eating meals, and providing healing and acceptance. There are many emotions that come about in a typical visit. This past week, some of us from the Irvine and Tehachapi UCC arrived and offered our usual “spa” day. We washed feet, rubbed on lotion, and provided massages to residents, beginning with those most ill. People in the tuberculosis unit nearly always die and sadly, there is about one death per week. The residents and those of us who visit, try to provide some amount of comfort to the bedridden. Then we offer up the same acts of service, including facials, to the ambulatory residents and we paint little girls fingernails bright and sparkly. It is an afternoon of healing touch and joy. During our visit, we were happy to hear that 20-something, “Isabel,” found a husband and no longer lives at the shelter. She was discovered positive for HIV as a young girl, but nobody knows why. Her parents were afraid of HIV and they dropped her off, never to see her again. The residents cared for her and made sure her beau was worthy of her hand. There are as many unique stories as there are people at this mission partner of ours. Beautiful trans-female, “Joanna,” was shunned by her father and previously affected by self-hatred. Now, Joanna is no longer willing to be a street worker. She has dignity and self-worth and feels the love of God. Several of the residents have suffered strokes related to their addictions, HIV and health status, and they are mostly paralyzed on one side of their body. 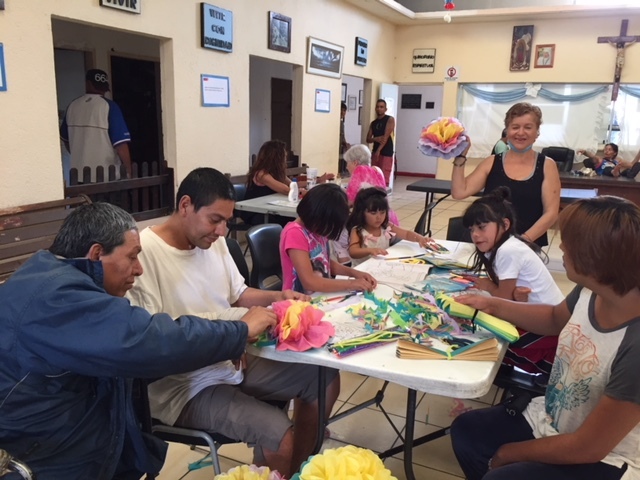 They didn’t think they could manage making paper flowers, with only one good hand, but wanted to throw a great fiesta for their retiring DOC missionary, Jerri Handy. So, some of the guys paired up and together used pairs of two good hands to make flowers. One of the men, “Juan,” who has lost a leg, speaks six languages, only he can’t speak any of them since his stroke. Instead, he writes in multiple languages on his wipe-off board. He wrote about his deep appreciation for all that Jerri has meant to Las Memorias. During Jerri’s nearly four year tenure, churches have visited and some, especially those at the Irvine UCC, have provided funds and assistance to build a whole new dormitory for residents. It was blessed during the going away fiesta. Jerri also leaves behind an furnished apartment for visiting missionaries and pastors plus an active 12-step healing program she began for residents. She has touched many lives and any church would benefit by inviting her to come and tell them about this incredible place. Certainly, Jesus was there with us, amongst the outcasts, the sick, the poor, the living and the dying. If you wish to see Jesus, it seems easy at this place, where children enjoy a piñata on one side of the dining hall and someone else is slipping into death in the adjacent infirmary. We who visited, got to share our blessings, touch and be touched, and intensely experience being disciples of Christ. Contact Irvine UCC or Rev. Nancy Bacon in Tehachapi if your church would like to learn more, then go! Find Jesus!